When we came to Thailand, we were not sure what God was calling us to do here. But we did know one thing, and with absolute assurance: He had lead us here, and to this very border. Now looking back, we can trace His hand from the beginning. 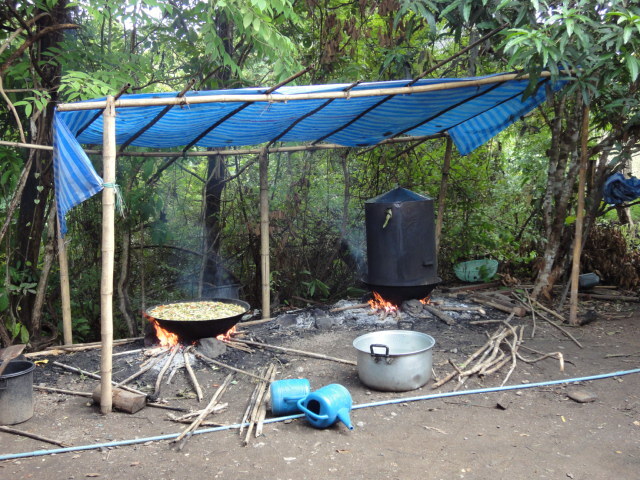 The first person in our family to be involved with the Lay Klo Yaw school was Maria. She was 17 at the time. As soon as she saw it, she knew it was the place she needed and wanted to be. The children tugged on her heart strings the most. During her time there, she taught 45 active, squirmy kindergarten children. 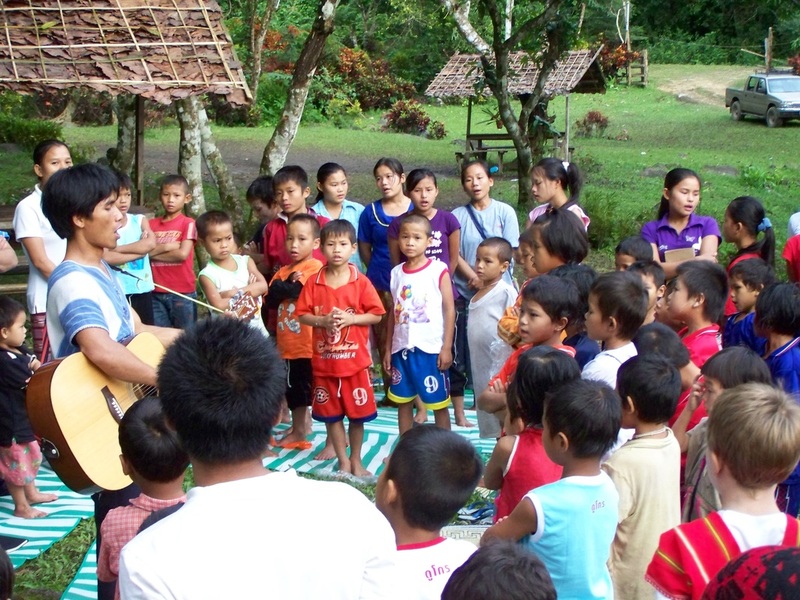 Maria teaching kindergarten at the Lay Klo Yaw school. With momo Susanna, who left that same year. 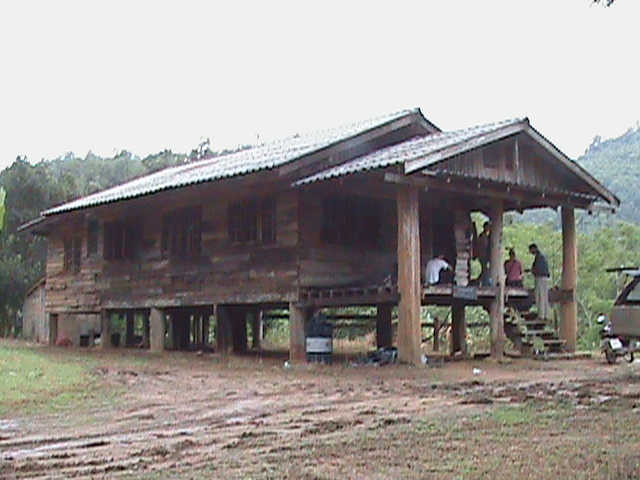 In the meanwhile, God clearly led us to a home close by, on the Thai side of the border. From there we could support the work done at the school, and be near in case of trouble. 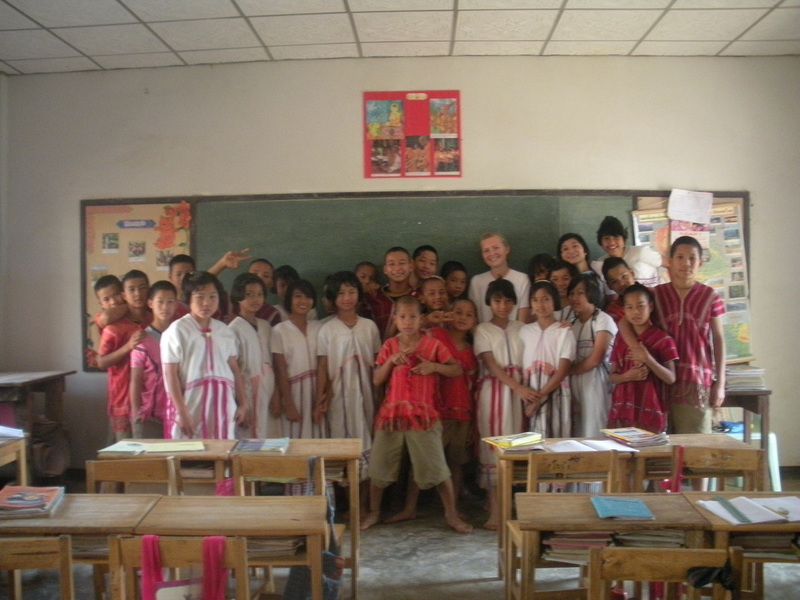 Later Emily started teaching in a Karen mountain village in Thailand about thirty minutes away, where she lived in the headman’s home teaching English at the local school. 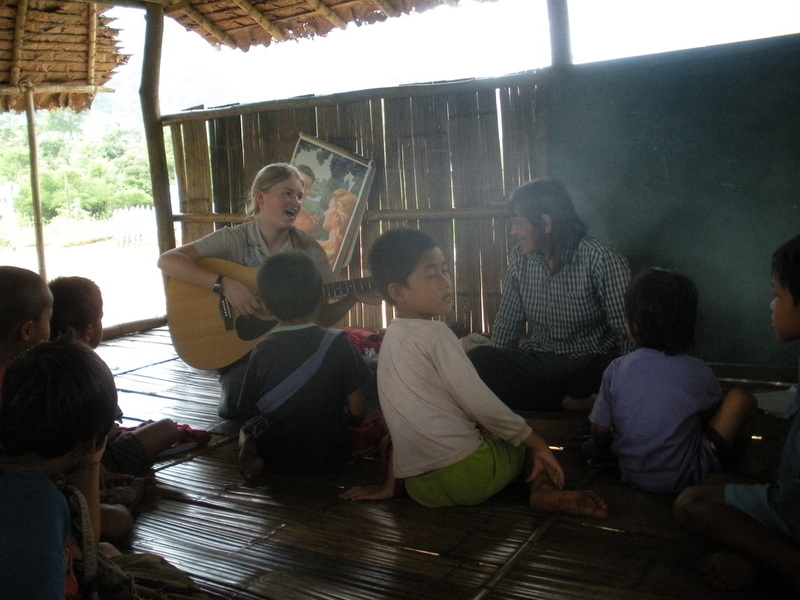 Emily teaching in a Karen village on a Thai mountain. After settling here, we realized we needed a relationship with the people around us. We prayed for God to break down prejudice, bind their hearts to ours, and help them to trust us. God started answering our prayer with a Karen young man who was sent to stay with us for a time. He was fluent in Thai, English, and Karen, and had been trained at an orphanage in another area to bring refugees through check points to the hospital for medical care. God led in marvelous ways so that this work could be done here too. Soon we had our hands full ministering to these precious people, many of whom had never received medical care for their many ailments. We would go forth in faith trusting God to provide for their needs, often we would drive to the hospital several times a day. We would prayerfully faithfully lovingly do to them all the good we could. This labor of love was the most fulfilling and rewarding experience we’d ever had. It was a joy to be needed, useful, and to see their burdens being lifted. Before it had been the children who had stolen our hearts, now it was the Karen as a whole, a persecuted and downtrodden people. The Karen are the most beautiful people we have ever known, in spite of being so destitute, so tired, so hungry, so needy, and some, so very dirty. 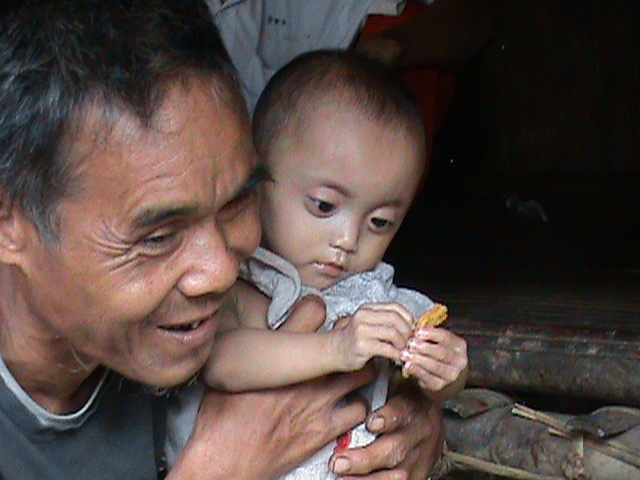 "The blind man" who we assist, holding his sweet girl, who was given nourishing food due to malnutrition. 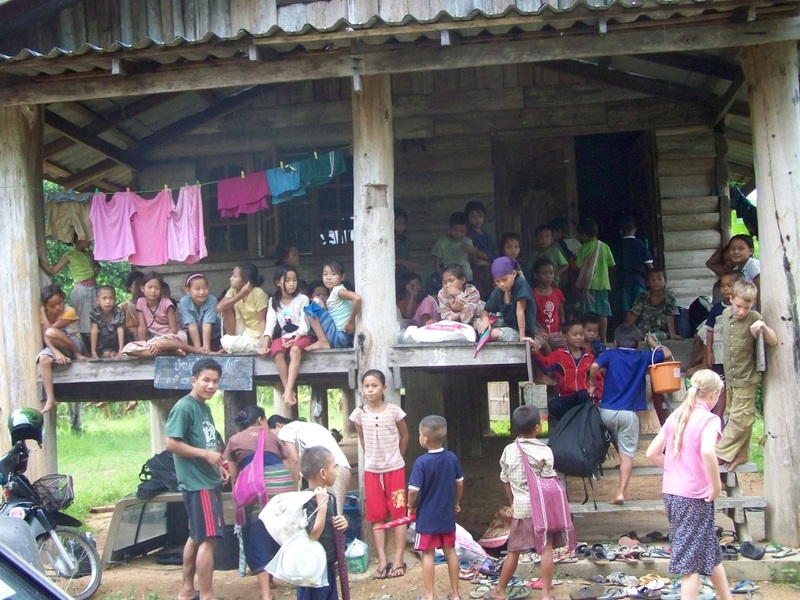 As Emily was looking forward to a year of teaching at Lay Klo Yaw, we were hearing rumors of war. She counted the cost and was willing to go, even if it was through death…June 2nd, she was brought to the school, and settled in cozily in her hut. She called us on her cell phone, she said she was so happy to be there and that the school was such a beautiful Christian place. Fully primitive, Lay Klo Yaw was beautiful out of the ordinary sense. June 3rd would have been the first day of school, but later that same evening we received word that there would be an attack in 3 days. The next day the little children came seven trucks full to our house. Now, our house was only a little house—just one bedroom. What to do? 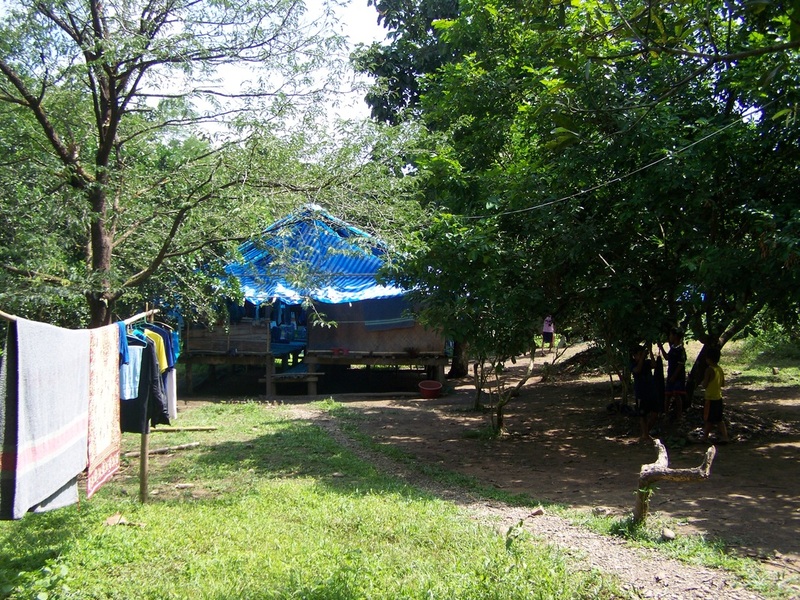 God had a plan; the neighboring property, a lime orchard, had a bigger structure that we were able to use for a short time. During the next few days, all the children came except the older boys who stayed till the very end, taking care of things and taking trips with the school’s things. Every day we would say “bye” to them after they would bring over more kids, and they would overly confidently say—“See you tomorrow!” Thank God we did always see them the next day. The first day of the evacuation. We could only keep the kids at the lime orchard for a short time, and it was not safe to keep the children at our house so close to the border and the fighting. Again, what to do? We couldn’t send them home; not all of them even had homes, and some homes were in the war zone. The only place that we knew of was our land lord’s retreat on the mountain. We had felt that we had no choice. God placed the burden for the children on our hearts, and how could we let them go? 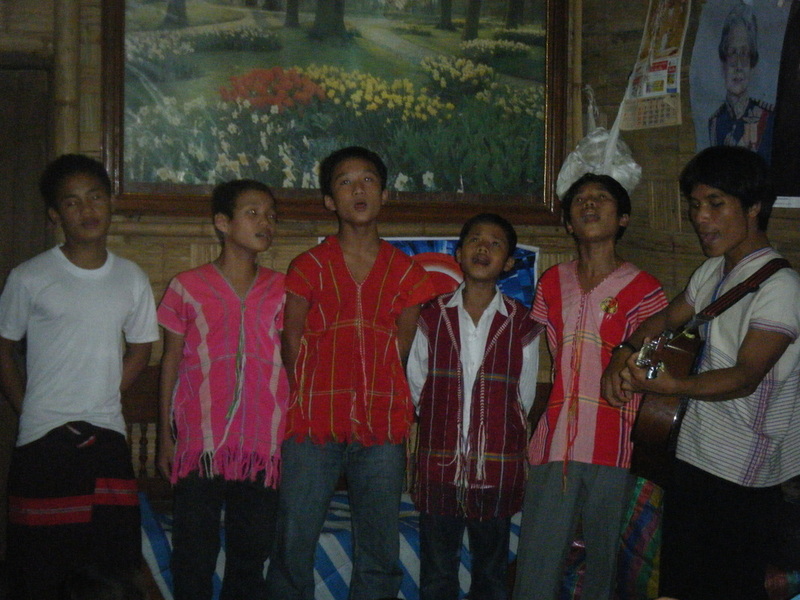 It was beautiful to hear these children singing about Jesus and to see their love for God. God paid a much higher price for them when He gave His only Son. While the children and their teachers were at the retreat on the mountain, the fighting started in earnest down here. Anna came down with measles, and Paul was kept busy taking patients to the hospital in the truck. Josiah and I made a little game out of the shooting that was booming close—“Count the bullets, Josiah….” There were times I wished we could go with Paul to the hospital to get away from the fighting. God knew we needed a lesson in trust. As we prepared for furlough that year, we could not imagine leaving our precious students and the patients and the poor without someone to care for them. We felt impressed to ask Gayle if she would please come for three months to fill in in our absence...Gayle, a former ER nurse, joined the work with her two sons Bradley and Micah. She is a woman of skill, stamina and compassion. Gayle is also deeply in love with Jesus. Gayle's persevering labor exploded the growth of the work to new dimensions. Before she came, we could and did bring the sick to the hospital, pay their bills, make sure they had follow-up care, bringing them through the checkpoints, fervently praying... the blind and the poorest of the poor. Soon our front porch turned into a very busy clinic, the people drawn by her nursing skills and love. 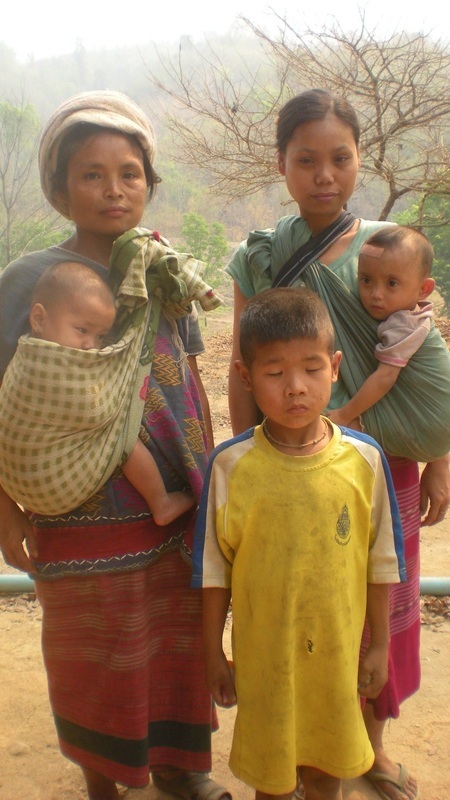 Patients came from far and near, some had even walked for days from the mountains of Burma. The day Gayle first came...as we made our way with her and her boys down to the border... Gayle's eyes got bigger and bigger. “I didn’t know it was this close to Burma!” she exclaimed. It is close—right on the banks of the Moei River which marks the border and behind which the Burmese mountains tower. Over the next week, we introduced Gayle to the school and took her into the villages to meet the patients. giving her a list of surgeries and doctors appointments due, and so on...Then we left Gayle, Blet Jaw (The principal at the time), Emily and thara Eh K'Nyaw to cover for us for three months. We were happy to be able to leave confidently. Knowing that the work was in good hands while we had to be gone. Eh K'Nyaw leading out in worship up on the mountain, away from the sound of war. 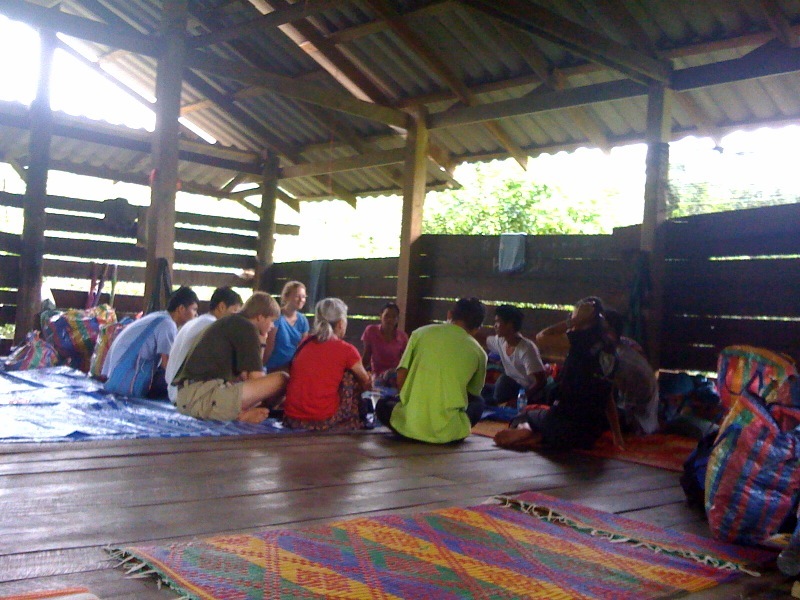 First staff meeting in the lime orchard; Karen staff, Eh K'Nyaw, Blet Jaw, tharamo Wah Ney Paw, Gayle and Emily. Jason was there although at the time working at another school. 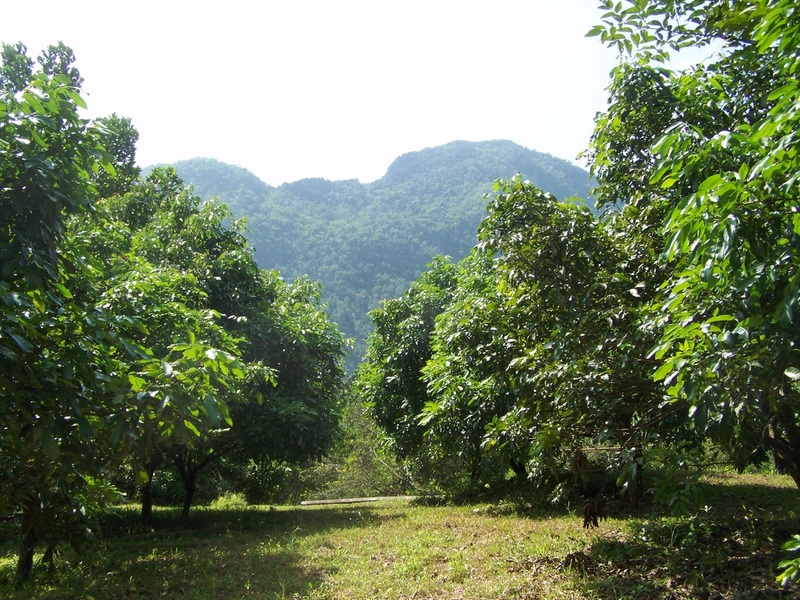 The "Beh Noh Kleh Gla" Lime orchard. God's blessing! Upon returning to Thailand and our beloved people, it seemed impossible to keep the children and school on Thai soil...we sought help from various people and organizations, but everyone said it was impossible. We believed that God had told us to persist and not give up and that He wanted these children and youth for His own glory. Missionary friends arranged for us to meet a Thai woman who offered to place our school under her foundation, with no strings attached. Her love for people and willingness to tackle the Thai bureaucracy for us we greatly appreciate and count as a rich blessing. We thank God for her servant’s heart. 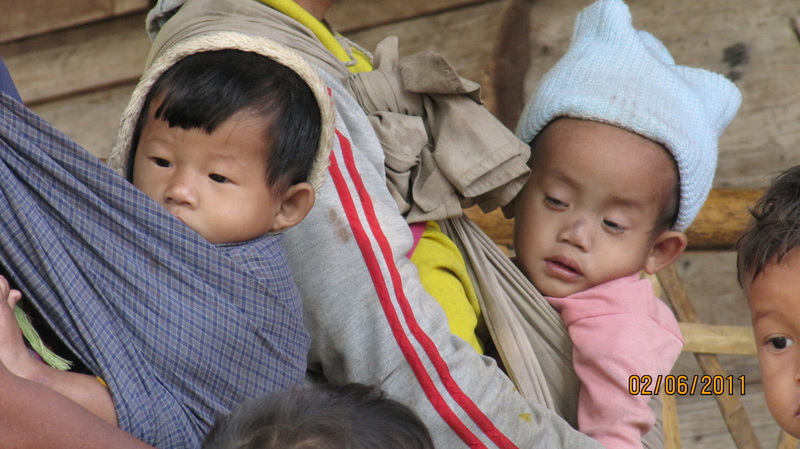 God called Gayle to venture out and answer the call of the needs of the remote mountian villages. We had throngs of sick villagers seeking help on our porch every day. We continued to do our best in meeting their needs, but in reality it was an impossibility. We had been given babies to care for, homeschooled Anna and Josiah and directed Sunshine Orchard. Maria had seen the medical need of the people, and decided to return to the states to pursue her dream of becoming an EMT. 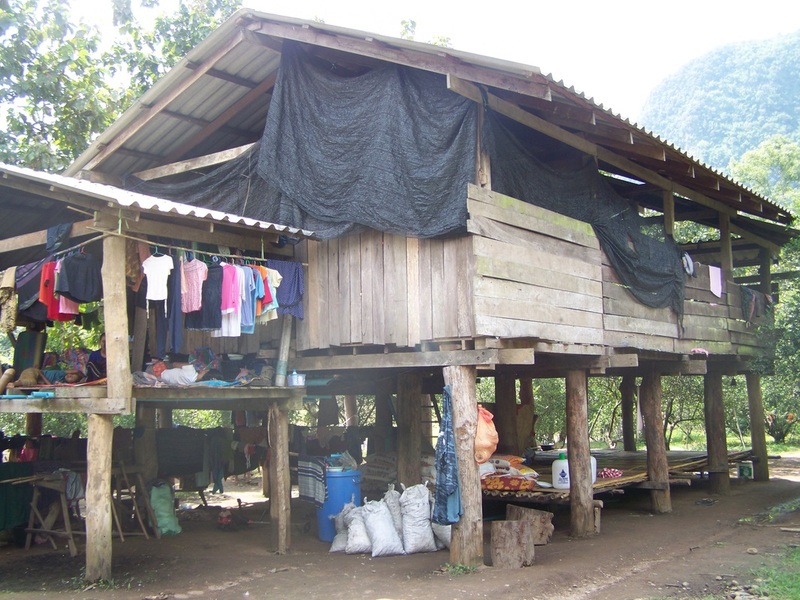 When she came back to Thailand again, she compared the way she had lived, in a primitive bamboo hut with no electricity, to our, in her eyes “plush” home, yet we did our best to live very simply, and our home was a very small wooden house. we slept on the hard floor, on a thin, braided plastic mat. Privacy did not exist—the house was almost always filled with sick people or students. Food was eaten on a mat on the floor “Welcome to the floor and bon appetite!” and a squatting style commode. But all this was too soft for her. There was glass in the windows and mosquito screens, a small refrigerator and a two-top propane burner. Although she knew that the front porch was filled with poor, sick, and destitute refugees in need of medical attention, she felt that help was congregated in one spot and off she went in search of a place far out of the way—and she found it through a friend. You couldn't even drive the truck into her new village, and the motorbike got in only with great effort. 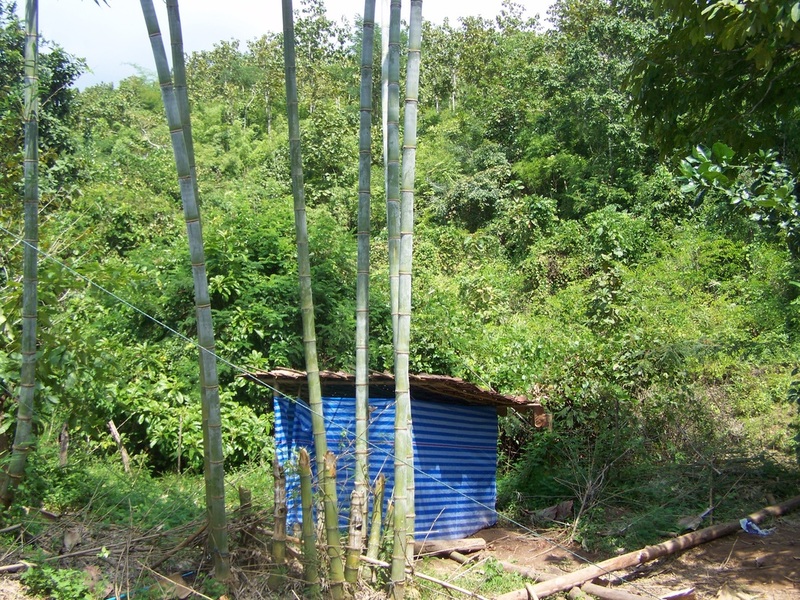 Her work was to care for the medical needs of the people The people provided a hut for her. There was a Buddhist monastery and an old Catholic church. These mountains are full of places like this, places in need of a ray from the light which we enjoy. Twice Maria's motorbike was stolen and she was stuck down at our house, with the sick gathered on the porch...she surrendered to their need and committed to train students to become medical health workers. Nine students graduated receiving medical backpacks and able to carry forth the medical ministry. We were blessed to have their help. Later Maria returned to live and serve at Sunshine Orchard and this is when God led her to rescue premature abused and neclected dying twin babies. Jabez survived and Maria became a mother. Today we are looking back in wonderment of everything that God has done at Sunshine Orchard, we can trace God's hand in each turn of events, and can indeed see that He is a faithful provider and guide. Through the years we were joined with additional foreign missionaries. We are thankful for each person who have ministered on behalf of the children and youth here at Sunshine Orchard. Each day have been a new experience in trusting God, taking Him at His word, going forward in faith. Often we would not know how to provide for the daily needs of the children, nor how to pay for the medical needs of the sick and provision for the poor, neither did we have a clue in how to run a school...we went forward as each new need arose like a person walking in the dark, yet with assurance that behind each closed door there would be light, so the effort was to get through the dark, stumble toward the door (Jesus) and grasp the handle (His word), push it down (prayer) and God never did let us down, the light always shone through and God always provided for the needs at hand.